Choosing what to wear when kayaking or canoeing will vary depending on various factors and could determine whether you have a fantastic time or not. So how do you know what to wear? Will you need overnight gear or a change of clothing? To give you a better idea of what you might need to take with you and what you should wear on your next paddling trip, we have put together some useful information. We’ll guide you through what you should wear in different weather and water conditions and help you pack for your multi-day trip. First Up: What Are The Conditions Like? What Should I Wear In Warm Conditions? What Should I Wear In Cool or Cold Conditions? I’m Going On A Kayak Camping Trip. What Clothes Should I Bring? The main factor in determining what you should wear will be the conditions of where you plan to paddle. While the weather can play a significant role in choosing your clothing, the temperature of the water will likely be more important in the event that you capsize. - What type of water will you be paddling in? - Will the water be relatively warm or cool? - Will there be waves, current or whitewater? Keep in mind the climate where you plan on paddling and the weather forecast for the days that you’re going to be on the water. Depending on where you are in the world, and particularly the time of year, oceans and lakes can be pretty cold, even when the weather is warm. So, dressing appropriately for the temperature of the water is usually a good idea. If you’re in a sit-on-top and you’re paddling on the coastal waters of the Gulf of Mexico in the height of summer, you will probably have more issue with being too warm from the sun than too cold from the water. If you’re not sure of the temperature of the lake or ocean before you head out it might be a good idea to wear clothing that would be suitable if the water was cold. Even if you don’t plan on getting wet, it’s always better to be prepared for a capsize. Plus, you can always remove your extra layers if you find the water is warm when you get there. It’s a good thing to keep in mind that whitewater will almost always be cold, so no matter what the weather might be like you should prepare accordingly, wearing suitable clothing for taking a dip in cold water. 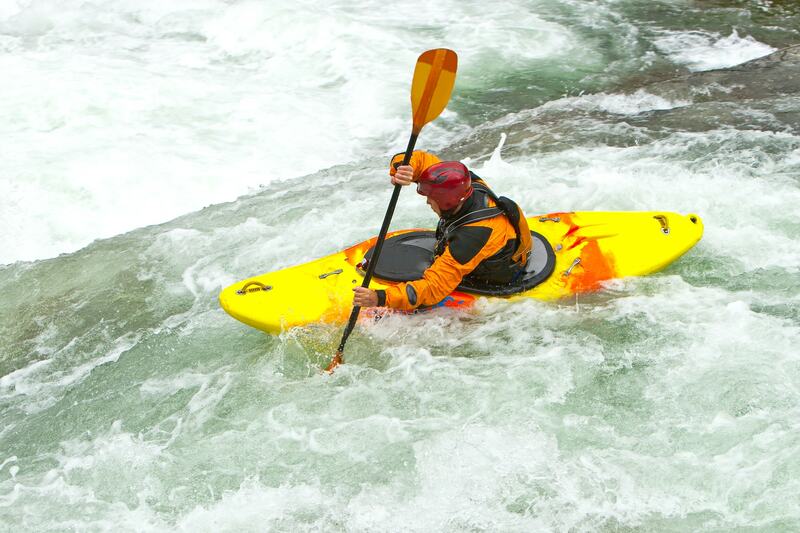 Whitewater paddling will likely mean that you will get wet, regardless of the type of vessel that you’re in. Before you head out, you’ll need to consider the likelihood that you may end up in the water. If you’re paddling on a calm river or shallow inland bay, the chances of you flipping your kayak or canoe will most likely be a lot lower than if you’re paddling where there are waves or strong current. It might be helpful to learn how to figure out what to wear based on the conditions. You will probably need a wetsuit or a drysuit if the combined temperature of the air and water is below 120 degrees Fahrenheit, and if the water is below 60 degrees you will likely need one regardless of the air temperature. If you’re planning ocean paddling, the National Oceanic and Atmospheric Administration (NOAA) have real time data on the temperature of the coastal waters around the US, so you can check the water temperature before you head out to the water. If you’ve worked out that both the water and air temperature will be warm while you’re paddling then you should be looking for clothing that is comfortable and lightweight. If it’s particularly hot, you might find that swimwear can be a good choice and can work well if you’re on a sit-on-top, as you can easily jump off for a swim to cool down. For added protection against the sun you could also wear a long sleeve, lightweight shirt or rash guard. Fabrics that wick moisture away from you are usually the best choice and they also tend to dry quicker when they get wet. What you wear on your feet is also important when you’re paddling. You should look for shoes that are waterproof and comfortable. Waterproof sandals can be fine, as long as they have straps that can be fastened to keep them on. There’s nothing worse than losing a shoe when you tip out your kayak, so flip flops are generally not a good idea but river shoes and paddling shoes can be a great choice of footwear, as they are often sturdy and fast drying. Choosing footwear for canoeing may not be quite as important, as there is probably less chance of you tipping out or getting wet when paddling, yet opting for a pair of shoes that will stay comfortably on your feet is still a good rule to follow. Using sunscreen is a must when you’re out in the hot sun, so if you’re wearing swimwear be particularly liberal when applying it. You might find that a hat is another accessory that may come in useful when you’re on the water, but make sure it’s attached securely to your head to prevent it from blowing away. 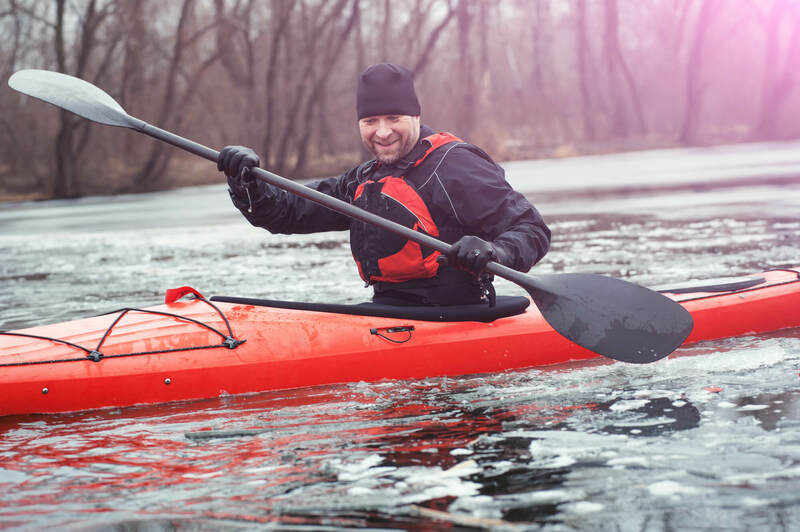 When paddling in colder conditions you will need to take extra precautions, as there are more risks to your safety if you fall in, such as heart shocks, problems breathing and hypothermia. Wearing a wetsuit or a drysuit is one of the best ways you can protect yourself from the cold conditions. The difference between them is that a wetsuit will allow a small amount of water inside that stays between your skin and the wetsuit layer, providing insulation, so you will feel the cold water initially if you wade out or fall in. A drysuit, just like its name would suggest, keeps you completely dry and prevents any water from penetrating through the suit. A drysuit can be a better option for very cold conditions, such as icy water, as it will keep you protected from the cold water if you were to fall in. If you’re paddling in a sit-inside then consider using a spray skirt, as this will help to keep any splashes and rain out of your cockpit, helping to keep your lower half dry and warm. If you’re wearing a full wetsuit (one with long sleeves and legs) then you should be fine without adding layers, as the suit is designed to let water in; providing insulation. However, with a short sleeved wetsuit you might want to add a base layer, but choose one that wicks moisture away and dries quickly. Stay away from cotton fabrics, as these can absorb moisture, meaning you won’t be as warm and dry. You can always add on additional layers of thermal clothing to give you extra warmth and for wearing a drysuit you might also need some thermal base layers for underneath - just make sure they’re moisture wicking. Neoprene booties and socks can be ideal for keeping your feet warm if you get wet. Wool socks can also be good for keeping you warm, although it won’t dry quite as quickly as some synthetic materials. Whether you’re canoeing or kayaking, wearing a waterproof jacket can be a good idea. For extra cold conditions you can always add a fleece layer underneath for additional warmth. Waterproof footwear can be essential, especially if you’re out in the rain or on a sit-on-top, as you are highly likely to get wet. Paddling shoes can be a good choice, or rubber rain boots. If you’re in a kayak you might find it’s a good idea to choose footwear that has enough grip on the bottom to allow you to keep your feet in place to aid balance. If you’re in a canoe and choose to kneel, you might want to go for footwear that will be flexible enough to give your toes comfort while kneeling. To keep your hands warm and dry you may want to invest in some paddling gloves, if you’re planning on paddling regularly, as these can help to prevent blisters as well as keep your hands protected from the elements. The weather can be unpredictable, especially on a camping trip, so it’s better to be prepared for any eventuality when you head out on the water. One of the best things you can do is to wear light layers, as this means you’ll be able to take off and put on clothes depending on the conditions. When you’re going camping, having a dry bag filled with spare clothes will make sure your clean clothes stay dry, even if you do end up in the water. Packing moisture wicking, synthetic fabrics are ideal, as they should dry quickly and can be layered. Having waterproof clothing with you, such as pants, might be a good idea, as these can be worn both while you’re paddling and on land. A waterproof jacket will also come in handy. You should also consider taking along a spare bag for you to store your dirty clothes in to prevent any of your clean, dry gear from getting wet. Remember that when you’re on the land you may need a different pair of shoes, especially if you’re going to be hiking any distance. It’s always a good idea to pack a second pair of shoes just in case your feet end up wet and you need to change. Don’t forget some extra socks, including some for wearing while you’re in your kayak and some for when you’re on land. The short answer is yes! You should always wear a life jacket whether you’re in a sit-on-top, a sit-inside or a canoe. There are a few different designs of life jackets that can be ideal for paddling. A standard Personal Flotation Device (PFD) can be the most versatile and easy to maintain, as they contain a buoyant foam that will automatically float. It’s also possible to get inflatable PFDs, including ones that can be worn around the waist. There are two types of inflatables; automatic and manual, with the automatic one inflating on contact with water and the manual one requiring a cord to be pulled to inflate it. Having a PFD that fits you well is important when you’re paddling, as you will need to be able to have full movement of your arms and upper body in order to paddle. Life jackets that are designed for paddlers will often have larger openings at the arms and will tend to have less flotation at the shoulders. The PFD should fit you snugly but should still be comfortable and it’s important that it’s not able to slip up above your shoulders. When you’re in a canoe or kayak, you will also need to consider the comfort of the life jacket while you’re seated, as this can push the PFD up towards your ears if it doesn’t fit correctly. It’s a good idea to test it out before you head to the water. Sit down and practice your paddling motions on dry land to make sure you’ll be comfortable and safe when you get onto the water. It can be beneficial to have someone else pull up on the shoulder straps of your life jacket to see if it moves. If it rides up too high and is at the tightest fit, then you may need a smaller size. Paddling PFDs will often come with extra storage options, which can be handy when you’re on the water. Zippered pockets can be useful for storing smaller items that you want to keep with you at all times, such as your sun protection. The next time you head out on the water you should have a better idea of what to wear to keep you comfortable. Try to look for breathable fabrics that are lightweight to allow you to move and paddle comfortably, and keep in mind the conditions! Now you know how to stay safer and drier in your canoe or kayak, why not share this with your fellow paddlers? And if you have any comments or questions, just let us know.